Creating a special connection with nature starts from a young age and this special bound with the natural would continues into adulthood. I was probably 5 or 6 years old when my parents first took me on a camping trip and I remember I had so much fun playing in the the endless green filed and chasing birds. My parents passed on their love of the great outdoors to me, whenever we would go camping or hiking my mother would tell me interesting stories about different animals and plants, while my father taught me how to stay safe in the wild. Now, that I’m in my twenties I cherish those childhood memories and whenever I have some free time I like to go hiking with my boyfriend. The hiking trail was actually the place where I crossed ways with love. I was on a long hiking trip with my friends in Cradle Mountain national park when I first met my boyfriend, who was also there with his friends to test his hiking skills and enjoy the beautiful sceneries. We joined our groups and continued with the hike together. After a short conversation my boyfriend told me that my eyes resembled the lush greenery of the Ballroom Forest, which is one of the most beautiful areas of the whole natural park. I can’t help but blush a little whenever I think of that moment because in all honesty that was the most romantic thing I’ve ever heard and from that wonderful moment on the rest is history. We’ve been together for almost three years now and try to make as much wonderful memories in nature as we can by going on a hike at least once every two weeks. My boyfriend and I are especially excited to hit the trail during autumn, since both of us love exploring nature during this time of year. There is a sweet aroma in the air and the fallen leaves with their rich colour create a golden trail that simply invites you to step on it an immerse yourself into the untamed realms of the natural kingdom. So, as you can imagine, as soon as the first leaves started to fall from the tress, we started to plan our adventurous hiking trip. While we were packing our bags my boyfriend came up with the idea to go and explore the wild under the dazzling night’s sky. I’ve been on many daytime hikes, but I’ve never explored the trail after sunset while my boyfriend had been on a night hike with his friends only once. So, the idea of seeing nature dressed in her night gown sounded both fun and exciting. The decision was made- we’re going on an adventurous night hike. Preparations for a hike after sunset are a bit different than usual. Beside a backpack filed with bottles of water, snacks and first aid kit, now we also needed to get something that would help us illuminate the trail at night. While my initial plan was to get us both bright flashlights, after looking at all the practical features that a head torch for sale has, I figured the best thing would be to purchase head torches that would produce bright and clear light. 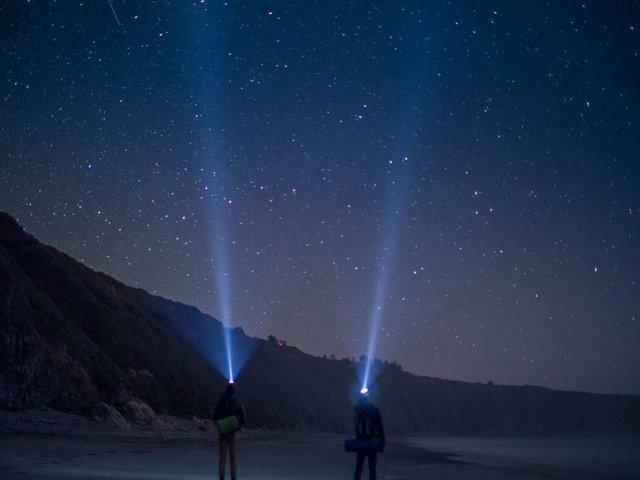 After comparing different models we decided that it would be best to get a LED head torch for sale simply because its designed to produce amazing constant brightness, which is exactly what we needed for our night hike. This type of head torch is very comfortable to wear due to its small compact design and features a multicoloured LED indicator. It’s powered by batteries and due to the low power consumption of the LED bulbs the torch is able to produce long-lasting light. Another reason why we opted for a LED headlamp is its durable design. It has a solid body that can withstand shock and impact and is designed to be waterproof and dust resistant. We got three head torches, with one serving as a back-up light so as to be fully prepared to expose the hidden obstacles of the hiking trail. Since it’s much colder at night we got thick cotton jackets and sturdy hiking boots that would provide the required support for rough terrain. We also added to out backpack of essentials a few more items, such as compass, pocket knife, some extra clothing and a practical fire starter. With our bags all packed we were ready for out exciting adventure in the wild. Nature be ready to reveal all your splendour at night because here we come! This entry was posted in Electronics and tagged flashlights, head torch, lights, torch by australiaonline. Bookmark the permalink.